The LS9208 high-speed bar code scanner saves time and delivers versatility, switching easily between hand-held and hands-free operation. The 100-line rastering omni-directional scan pattern lets you quickly capture codes no matter how they are presented. Its small footprint and integrated Checkpoint Electronic Article Surveillance (EAS) antenna save counter space. To ensure compatibility with new standards, the device supports the GS1 DataBar symbology and 14-digit Global Trade Item Number (GTIN) bar codes. Perfect for reading bar code menus and pick lists. Protects your hardware investment with flexible host connectivity. Allows for easy replacement or upgrade. Fits into the tightest cash/wrap environment. Optimises operator comfort and efficiency. Protects scan module assembly increasing durability. Saves valuable counter space with integrated antenna. Facilitates setup using PC download. Ensures compatibility with new symbology. Capable of decoding and transmitting 14-digit GTINs, where appropriate. Enables users to modify data prior to sending to host computer, eliminating costly modifications to the host software. 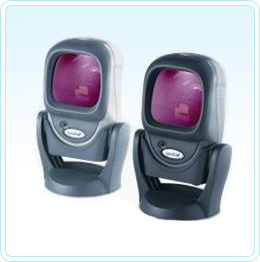 Scanner warranty The Symbol LS9208 Omni-directional scanner is guaranteed against defects in workmanship and materials for a period of 30 months from date of shipment, provided that the product remains unmodified and is operated under normal and proper conditions. See the complete guarantee for details.